Went down to Mrs Maq’s Chair this morning to watch the QM2 come in, at the insistence of HWMBO. I initially wasn’t very enthused, but then Her Majesty hove into view. I’m uploading photos right now, but they’re taking their own sweet time: there are 314 to go up, and only 30 have gone up in the last 15 minutes, so wait a while before you look at the full set. 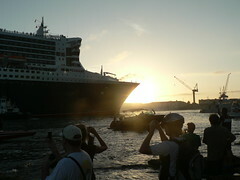 For more pics, mostly much better than mine, check out the QM2 and queenmary2 tags on flickr.